Finally! 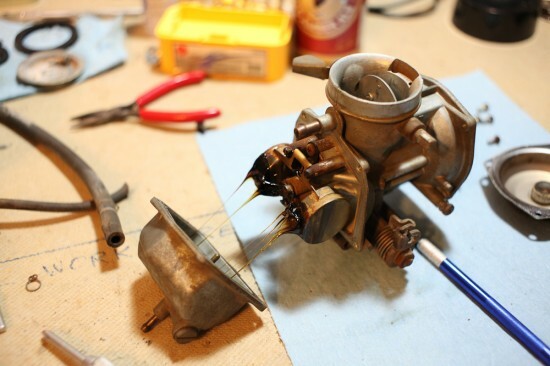 A full can of carb cleaner, half a can of WD-40, four days of soaking, many hours of scrubbing and scraping, and a couple of damaged jets and stripped screws later, I have the carburetors disassembled and cleaned of all that sticky tar. There are parts from all four carbs laid out there. The two missing bodies and float bowls, the “spares”, are still soaking; turns out that dry corrosion is much worse for moving parts than 30 years of semi-liquid gum and varnish. 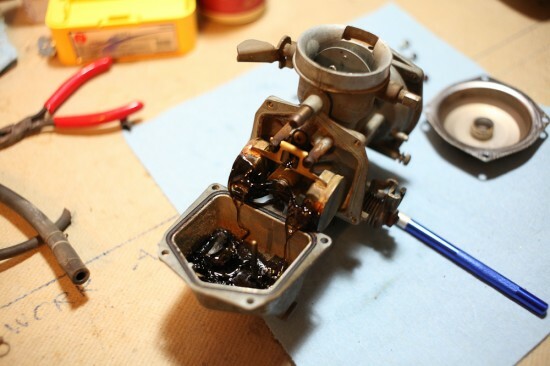 Corrosion eats right into the parts, chemically bonding them together and ruining surface finishes, but that black tar did a surprisingly good job of preserving whatever it was sitting on. 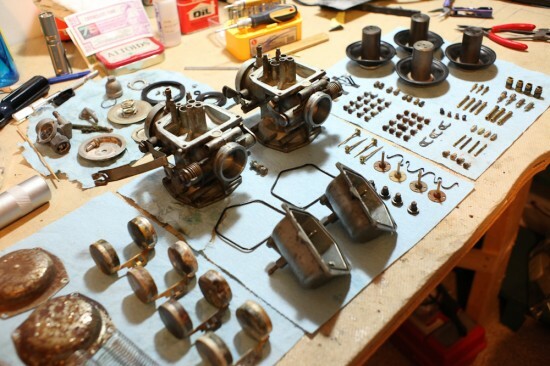 Though a couple of minor pieces were damaged in removal or just plain fell apart from age, all told I have more than enough pieces to make two good-condition Keihin 722As and maybe a third. Next step — reassembly! And maybe polishing the outsides if I can pick up some more polishing compound for the Dremel. I’ll probably end up painting those badly rusted top covers (far left) but the rest of it would look just fine as bare, clean aluminum, I think. Well, there’s your problem! Somebody tried to fill this bike up with molasses. I’ve seen varnish in gas tanks before, and this…isn’t it. Petrochemical varnish is just a nice translucent yellowish coating that scrubs right off. I suppose this is the result of a decent pool of liquid gasoline sitting, without stabilizers, for thirty-two years in a static environment? Some kind of very slow natural polymerization run to an extreme. I bet that given another few decades — or maybe much longer — it’d become something resembling amber. 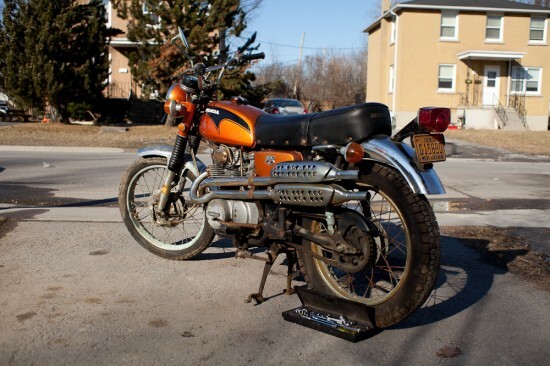 As fascinating as it is, the goo has to go, or this bike won’t run. I assume this stuff is still chemically similar to gasoline, and the can of xylene-based carb cleaner I have dissolves gasoline deposits, so I soaked everything in an excessive amount of the stuff and left it to sit overnight. I’ve created a separate page under Experiments for the work I’m doing to the motorcycle. I’ll keep posting about it on the main blog, but the detailed log will be found there in the future. Something new to work on! 1971 Honda CL350, the scrambler version (what would today be called a “dual-sport”) of the once-ubiquitous CB350. 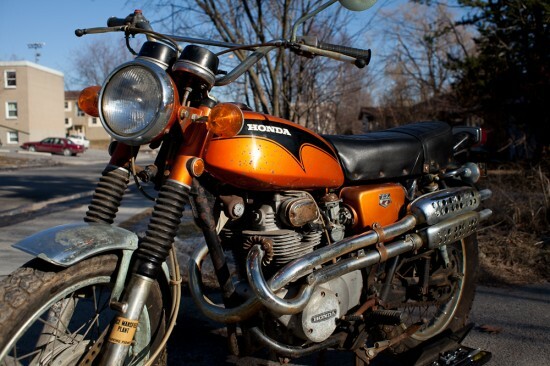 It’s been stored in a barn for the last 32 years. Has quite a bit of surface rust, but the underlying structure is in extremely good shape. The engine turns over and has good compression, the electricals work, the coil fires, the transmission goes through all the gears and, amazingly, the tires are still holding air from 1980. 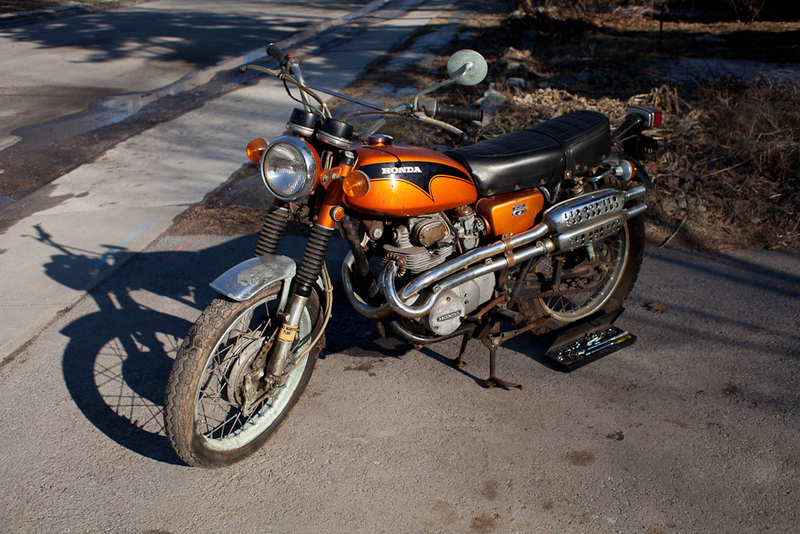 It needs new tires and chain for safety, of course, the forks make a bubbling noise, and new cables and brake linings wouldn’t be a bad idea…but I’m going to start by flushing all the fluids, cleaning the tank, and seeing if it’ll fire up with some new gas. 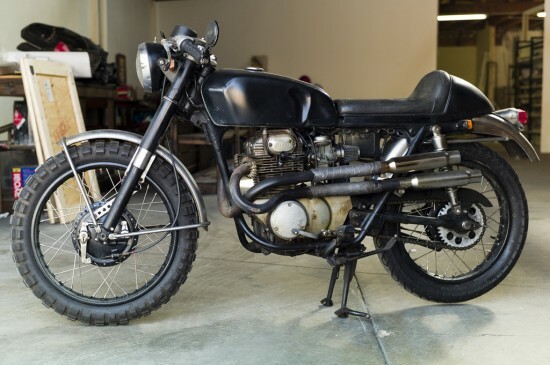 You may recognize this motorcycle if you’ve seen the recent version of The Girl With The Dragon Tattoo — the main character rides a modified ’69-70 CB350 with the headers from a CL, a café-racer seat, and a few other custom parts (below). I’m planning to keep mine mostly stock but I wouldn’t mind slightly lower handlebars and a different paint scheme…we’ll see! So, a new project that is both fun, and highly sustainable! Taking something from the scrap yard and restoring it to its original functional state is clearly the most energy-efficient carbon-neutral kind of recycling there is; much friendlier for the planet than buying any number of Priuses. Ultimate feel-good stuff.